Arriving two months after independence, volunteers originally worked as teachers health specialists, infrastructure planners, and agriculture extension workers. Since 2003, our work has focused exclusively on HIV/AIDS and improving schools in rural areas in collaboration with our government partners. Our newest group of Peace Corps Botswana Volunteers in Botswana celebrate the completion of their 12 weeks of training before moving to their sites. 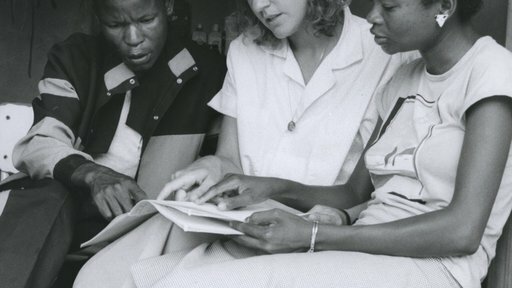 A Volunteer sits with two of her students in the early years of the Peace Corps program in Botswana. The landlocked country of Botswana, formerly known as Bechuanaland, was once one of the poorest countries on the continent when it gained independence from Britain in 1966. In the years that followed, the nation transformed itself, with one of the fastest growing economies in the world—thanks in part to strong leadership and the discovery of diamonds. The Peace Corps entered Botswana just two months after the country gained independence, and has been a dedicated partner in development since. More than 1,800 Peace Corps Volunteers served in Botswana from 1966 to 1997, contributing to nearly every sector of the country's development--including education, health, environment, urban planning, and economics. Volunteers filled significant gaps and made singular contributions to the development of the nation. 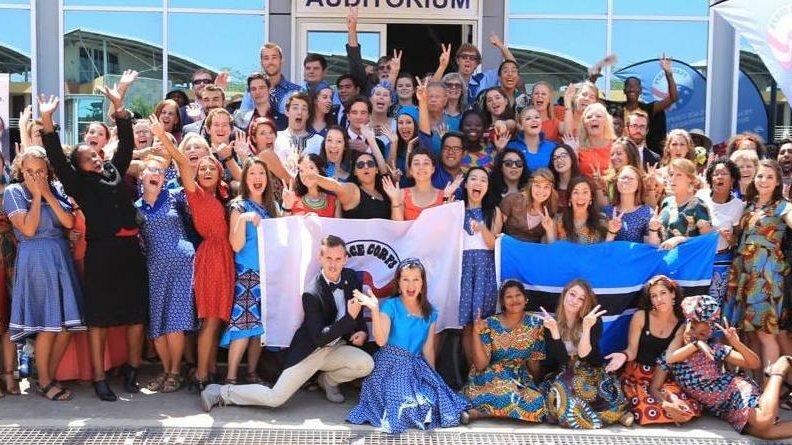 Many leaders in Botswana today have a Peace Corps connection—be it as a co-worker, teacher, or friend. Since independence, the nation has transformed itself and has reached upper-middle-income status. In addition to the economic growth over this time, the country’s per capita income grew rapidly, life expectancy at birth increased significantly, formal sector employment grew, and the nation’s infrastructure—including roads, power generation, schools, health facilities, and housing—increased dramatically. Partly due to Botswana’s remarkable economic transition, the Peace Corps withdrew from the country in 1997. However, the HIV/AIDS pandemic in the 1980s reversed decades of development as the population fell ill in huge numbers. During the epidemic's peak in 2000, a fifteen year old had a 50% chance of dying from an AIDS-related illness and life expectancy declined by 20 years in the hardest hit areas. In 2003, then-president Festus Mogae ramped up the nation's response to HIV, which included inviting Peace Corps to return to Botswana to support the fight against HIV/AIDS. The impact of this intense intervention has been dramatic, saving many lives. The country's response to HIV/AIDS, particularly with expecting mothers, has become a best practice for the global community. Due to the nation’s strong response to HIV/AIDS, Botswana has passed an epidemiological tipping point milestone—for every new person on treatment, there is less than one person infected. However, the nation still has the one of the highest HIV prevalence rates in the world. Through continued partnership with Botswana, Peace Corps is supporting the nation as it works towards an HIV-free generation.